As I’ve stated before when writing about the Wicked Witches of Oz, the idea that the Witches of the East and West are sisters comes from the MGM film, there being no hint of it in any of the books written prior to the movie’s release. After the movie, however, the idea caught on with Oz writers, and many stories utilize that premise. As such, it strikes me as perhaps being quasi-canonical simply by popular appeal. 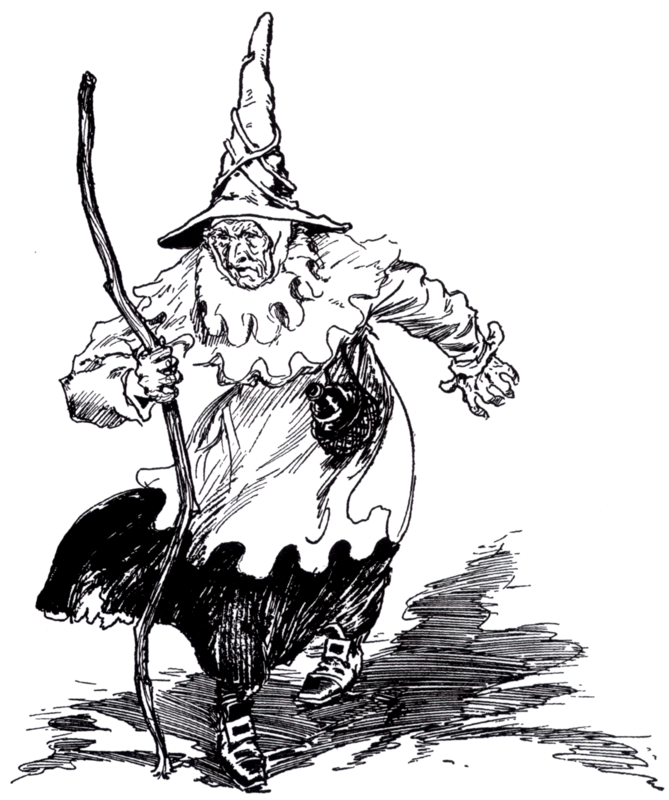 In Rachel Cosgrove Payes’ The Wicked Witch of Oz, Singra, the Wicked Witch of the South, claims to be a cousin of both the Eastern and Western Witches. This doesn’t necessarily make the WWE and WWW sisters (they could be cousins or not related at all), but it seems likely that Payes was working from that premise. Also, Eric Shanower has said that he considers his own Wicked Witch of the South from Enchanted Apples to be Singra’s sister, so that’s another relative. The odd one out here is Mombi, the Wicked Witch of the North. I had previously thought that Fred Otto’s short story “Mombi’s Pink Polkadot Vest” (which can be found in the 1985 Oziana) indicates that Mombi is another sister of the WWE and WWW, but another look at the story makes me think this might not be the case. Mombi does tell her fellow witch, “No sister could be kinder,” but this doesn’t mean they ARE sisters, just that she thinks of the WWW as being LIKE a sister. I haven’t reread the entire tale recently, but it looks as if the other references in it simply refer to Mombi and the WWW as colleagues, not relatives. As far as I can recall, the only source indicating Mombi is related to the other Wicked Witches is the animated film Journey Back to Oz, which is about as far from canonical as you can get. So maybe Mombi had no family connections to the others at all, and just happened to unite with the others due to a common goal. So anyway, if the Witches of the East and West are sisters, who are their parents? Wicked covers this, but I think that can be safely disregarded when talking about the Oz of the original books. One author of Baum-consistent Oz books who dealt with this issue is Peter Schulenburg, who identifies their mother as the Enchantress Vile, or E. Vile for short. She makes an appearance in Unwinged Monkey, and Emerald Enchantress gives her another daughter, Emmy, who is not wicked like her relatives. I don’t think either of those books give any indication as to who the father might be, but I could be forgetting. I believe March Laumer made the main Good and Wicked Witches all half-sisters, being daughters of Lurline by different fathers. As with most issues left unresolved by the Famous Forty, I doubt there will ever be a consensus answer here, but I do have to wonder what growing up in a family of evil magicians would have been like. This entry was posted in Characters, Eric Shanower, Fred Otto, L. Frank Baum, March Laumer, Oz, Oz Authors, Rachel Cosgrove Payes and tagged mgm, mombi, mombi's pink polkadot vest, oziana, peter schulenburg, singra, the emerald enchantress of oz, the enchanted apples of oz, the unwinged monkey of oz, the wicked witch of oz, wicked witch of the east, wicked witch of the west, witches. Bookmark the permalink. Alexander Volkov (and those following him) also considered the two wicked witches as sisters. That’s true, although he probably took this from the movie as well. I’m not too sure…it depends which version of his book this development emerged. If it was in the 1939 one, almost surely not and even if it was in 1959, I don’t think that many US films were shown in the USSR back then. Yeah, I don’t know, but it seems like the original 1939 publication date was not a coincidence.